~* West End Designs Journal *~: A funny for today!!! ** For the record I still LOVE my crocs and wear them regularly....now I am just ultra careful outside!!! Amen, Norma! 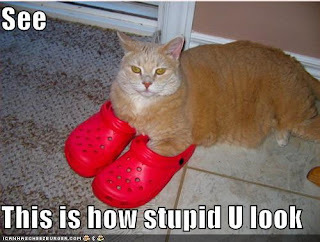 Crocs are pretty stupid-looking and an adorable ginger cat can't even make them cute - I agree! !